down at a laptop in order to write, edit, or design. 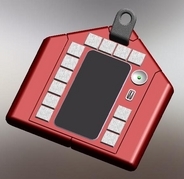 SōLäTiDō is developing Quijit, a Pendant Computer System with a fully programmable keyboard/controller that, when used with a head mounted display, and/or a smartphone, will allow creators of artistic, technical, and text based content to work and play while standing, walking, or dealing with all of life's realities. Smartphones and Augmented Reality headsets do amazing things but they don't enable real productivity because they lack a usable keyboard and mouse, for the artist, musician, researcher or other content creator. Laptops offer portable productivity for those who have the ability to stop, sit down and commit time to one particular task, but they're not really mobile. Tablets try to strike a happy medium between the phone and the laptop, but still fail to give the tactile interactivity required to be truly productive while mobile. By coupling a wearable, re-configurable keyboard to a smartphone and a near eye display, we can significantly increase the mobile productivity and expression of writers, designers, engineers, students, and other creators of content. A single, hackable version, can be coupled, via Bluetooth, to a Hololens, smartphone, or other mixed reality device, to use as a typing keyboard, gaming controller, or any other application specific use that the user desires. Re-programmable buttons, joy-sticks, and a touch-pad can accommodate whatever inputs are needed. When the articulated version is unfolded on a flat surface, it may be used as a laptop is used, but when folded, the user may wear it on a neck strap and operate it from the sides, placing fingers on the same keys they would operate in the desktop configuration. This leaves the hands free to let go of the keyboard in order to accomplish other tasks while standing walking or reclining. It is also possible to reconfigure the keys for other tasks, alphabets, or games. One additional option will be to use it as various musical instruments by assigning notes to the keys for the control of a synthesizer program, which may be further controlled using breath, bite and pitch bend wheel inputs. Other hacks and applications will be possible by embedding or connecting to other sensors and hardware, such as those introduced by Arduino, and Intel. We have started a new band that practices while we wait for the bus. I have the pressure tube that lets me use breath control on the saxophone app and the others are using the standard samples for guitar, bass, drums and keyboard. We can re-assign the keys to be whatever notes or controllers we want them to be, so we can even make up new instruments that could not even exist using natural physics. Whenever I get an emergency call from the office about a legal brief that has to be created or edited in time to be filed the same day, I'm really glad to have this device handy so I don't have to look for a work surface and then drag out the laptop. I'm addicted to my smartphone as much as the next guy, but when I am in the middle of nowhere, and I need to write something the length of War and Peace in twenty minutes, I need a tool that is designed for what I do. Out here in the rain forest, there's no place to put a laptop, especially when my team and I are on the move. When we catalog various species, we need to enter a bunch of data on the run. We can't really stop to do it, and it's not practical to enter that amount of text on a handheld device. When we were doing this on our phones with our thumbs, we would joke that the local primates were talking behind our backs, saying. . . .
Yeah! Right! These humans are sooooo evolved. forget to use the rest of their fingers. No wonder they have such trouble climbing trees. Now that we have added the Pendant Computer to our toolbox, we have a much smoother workday. The audio aspects of this thing are pretty cool too. The birdcall app helps us meet the grey parrots so we can monitor their recovery, and a few of us are even getting pretty good at playing folksongs around the campfire. This thing is pretty handy when I'm out monitoring the soil chemistry in the citrus groves. GPS coupled with the analytical probes from National Instruments really make it easy to enter all this into the cloud version of LabVIEW and map out where we can save fertilizer and water. It's tough to organize a day around raising kids, working part time and going to school. I'm really glad to have a device that allows me the flexibility to do my translation work, write term papers for my online classes, keep an eye on the kids and do the daily chores. We spend a great deal of time walking, waiting and riding on public transportation, so it's nice to be able to make that time productive. My brother hacked into this thing last week and added his own circuit for some robotics project he is working on. It's also handy that they left connections for other devices and room inside for more sensors. You know, when you hang it out there as far as I do, you really need to make every minute count. You never know when you're going to wake up and find out that you are a few billion in the hole. That is why I wear the Solatido wherever I go. This way I can change a contract to the way I want it to read instead of waiting until tomorrow to see if somebody else got it right. I can also participate in crowdsourcing online and be very productive during time that would otherwise be wasted, like here, waiting in line at airport security. I can be available to enter valuable and complex data for international client companies that need certain services from those of us who are experienced at dealing with the public. Excuse me, I have to take this. Hi, welcome to KFC, may I take your order? 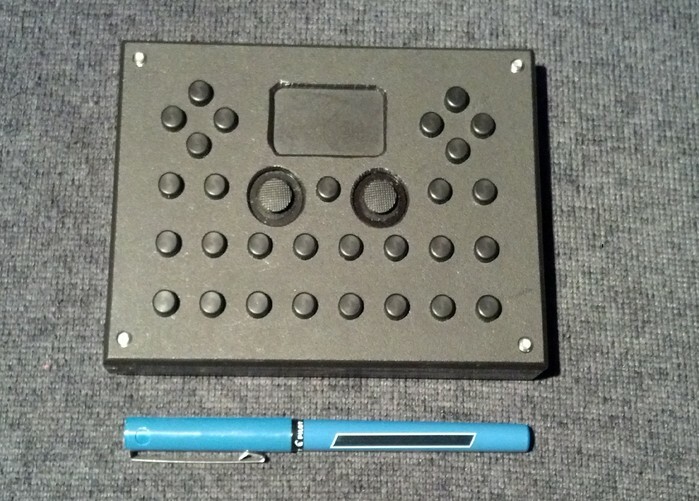 Wearable keyboard / controller as worn, with full size laptop keys. Keyboard / controller folded out to be used on a table top. Rear view (thumb side) showing installation of smartphone. Front view (typing side) showing labeling for both QWERTY and Dvorak keyboard layouts. The final version will have no key labels, since the key legend will be visible in the head mounted display, and will change with whatever application may be used at the time. for any other projects that may need to be attached. 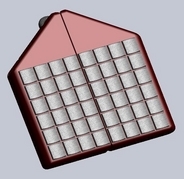 SolidWorks rendering of the rear (thumb side) view, showing cursor and gaming controls, as well as joy sticks and touch-pad. using discreet tactile switches and machined buttons. 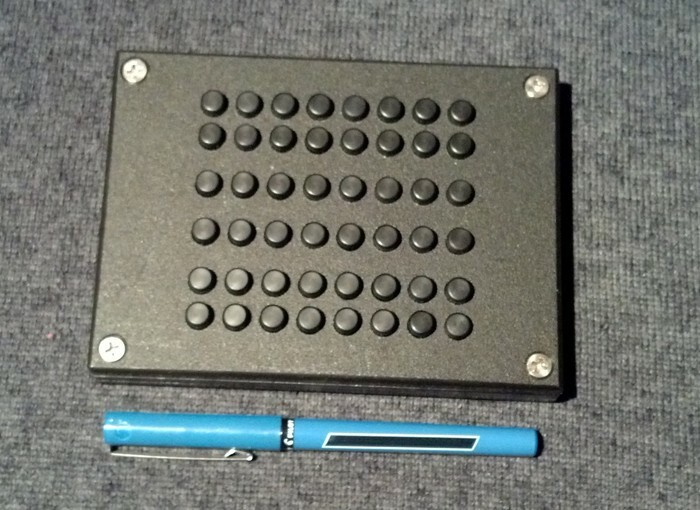 Rear of working prototype, showing touch-pad and joy sticks. in transition between the two modes. Rear (thumb) side of ergonomic model. Front (finger) side of ergonomic model. All website information Copyright 2015-2017, SOLATIDO INC.